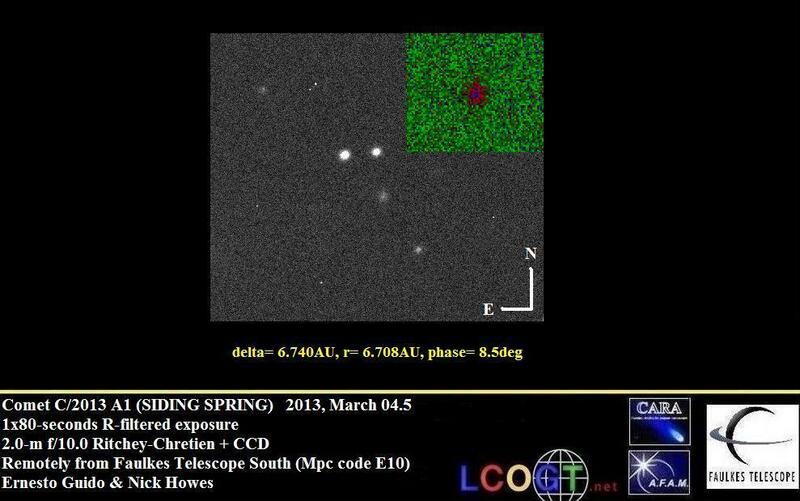 The discovery of comet C/2013 A1 (SIDING SPRING) was announced on Cbet nr. 3368 & M.P.E.C. 2013-A14, issued on 2013, January 05. 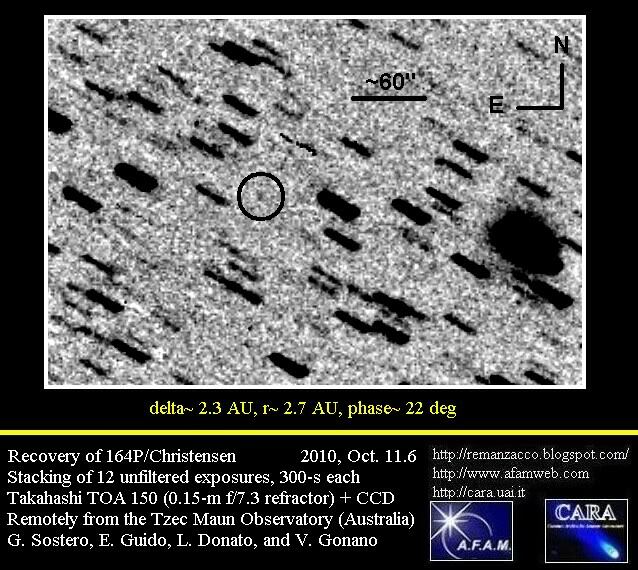 The comet was discovered on CCD images obtained by notable Australian observer R. H. McNaught with the 0.5-m Uppsala Schmidt telescope a few days earlier on Jan. 03 (with a discovery magnitude 18.6). 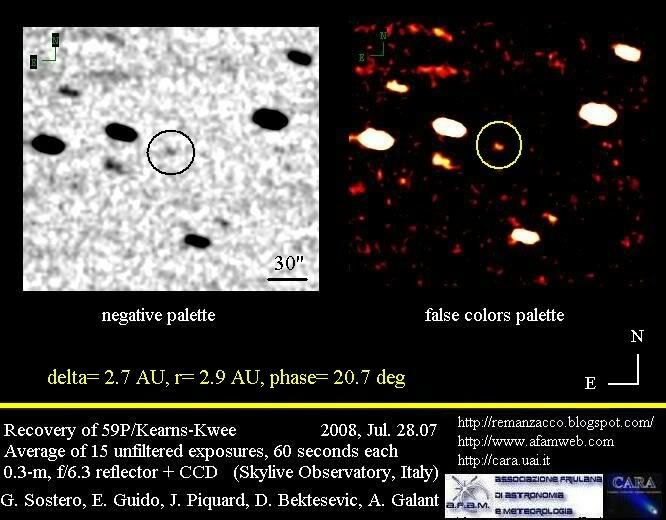 Precovery images of the comet *(images taken but not known/recorded of the comet) by the Catalina Sky Survey from 8 December 2012 and Pan-STARRS from 4 October 2012 were subsequently found and then used in an attempt to determine the orbit. It has been noted that C/2013 A1 will have a very close approach with planet Mars on October 19, 2014. With an observation arc thus far of 148 days, JPL/NASA give a nominal closest approach of ~0.0003578 A.U. which is around 53,500 km on 2014 Oct. 19 at approximately 19:28UT +/- 1:03. The comet will pass Mars at a relative velocity of 56 km/s. Early estimates for the diameter of the nucleus have varied from 5 up to 50 km. Due to the uncertainty within the orbital calculations, there is also a very small possibility that the comet may impact Mars (~ from 0.1% to 0.01% according to how you handle the observations thus far. See here for more info about this). By comparison below you can find a table of the the closest known approaches to the Earth by comets published on Minor Planet Center website. This list is intended to be complete for comets discovered after 1700 that approached the earth to within 0.1020 AU. 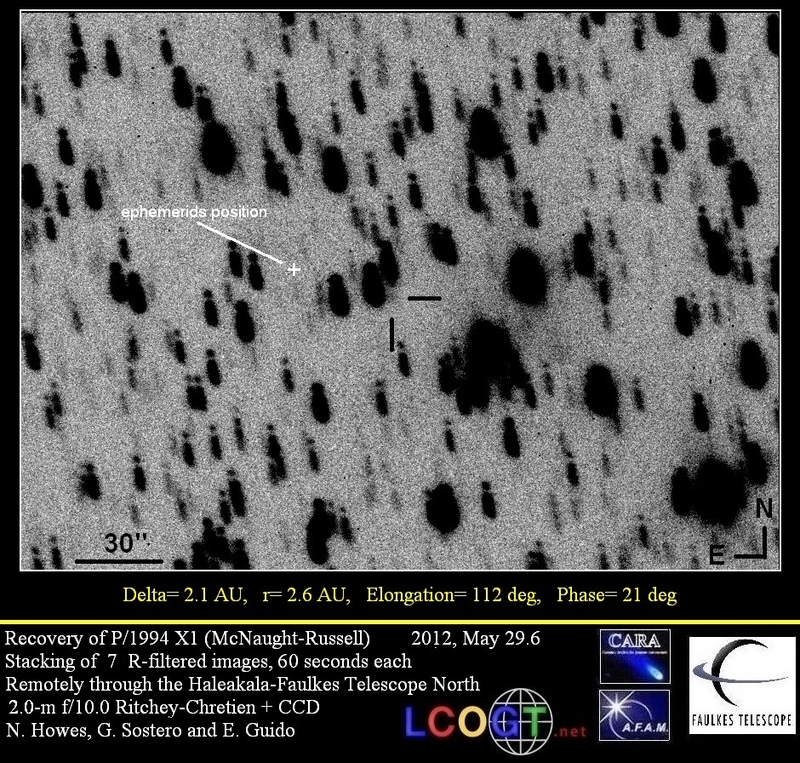 It also includes a number of well-documented earlier approaches by periodic comets. C/1491 B1 allegedly came to within 0.0094 AU on 1491 Feb. 20.0 TT, but the orbit of this comet is very uncertain. 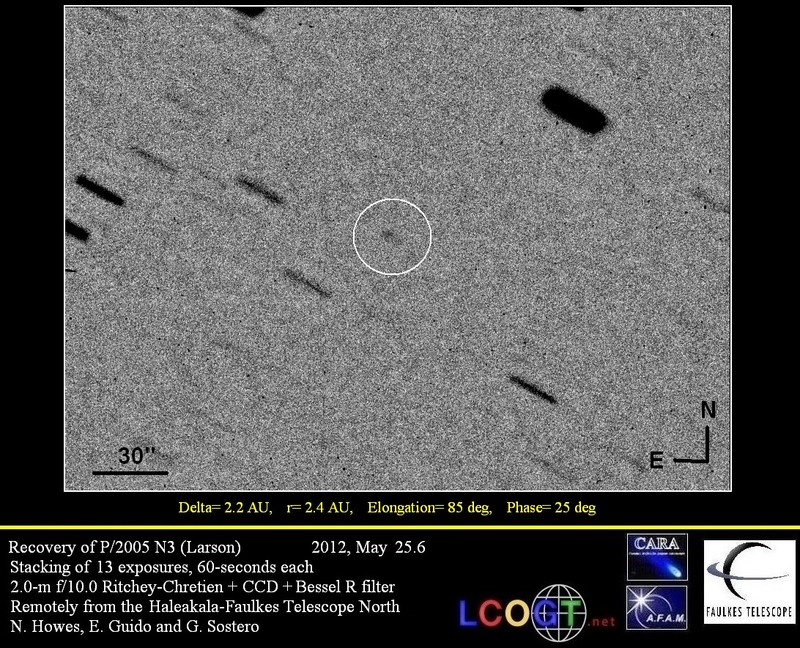 Below you can see an image of comet C/2013 A1 (single 80-second exposure. Click on the image for a bigger version). Our team will be closely monitoring this comet and feeding our observations to the minor planet centre to hopefully assist in resolving the orbit, and helping determine whether or not this comet will impact Mars. More info about this close approach here & here. 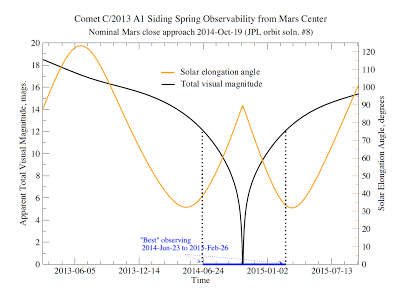 A plot published on NASA/JPL website shows how comet C/2013 A1 will appear as seen from Mars. The "best observing" occurs when the comet's total brightness is at least magnitude 12 and its elongation from the Sun is 30° or larger. "During the close Mars approach, the comet will likely achieve a total visual magnitude of zero or brighter as seen from Mars-based assets. 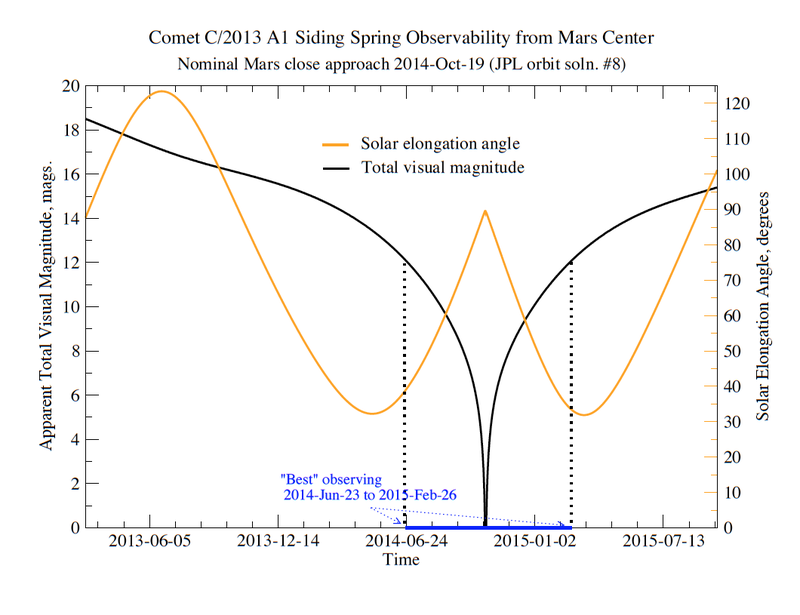 The attached illustration shows the comet's approximate, apparent visual magnitude and its solar elongation angle as a function of time as seen from Mars. Because the comet's apparent magnitude is so uncertain, the brightness curve was cut off at apparent visual magnitude zero. However, the comet may get brighter than magnitude zero as seen from Mars. From Earth, the comet will not likely reach naked eye brightness but it could brighten to visual magnitude 8 as seen from the southern hemisphere in mid-September 2014." "Our current estimate for the impact probability is less than one in six hundred and we expect that future observations will allow us to completely rule out a Mars impact." (click on the plot below for a bigger version). Three craft are circling the Red Planet right now (Mars Reconnaissance Orbiter, Mars Odyssey, and ESA's Mars Express), and both Curiosity and Opportunity are roving its surface. 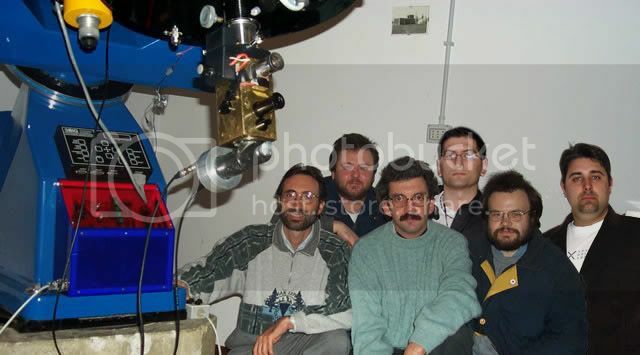 Potentially any of them might be commanded to take some comet pictures. "For example, one of Curiosity's Mast Cameras has a 100-mm focal length and color capability. If the comet performs as expected, says Michael Ravine of Malin Space Science Systems, which built the cameras, some imaging will definitely be planned". 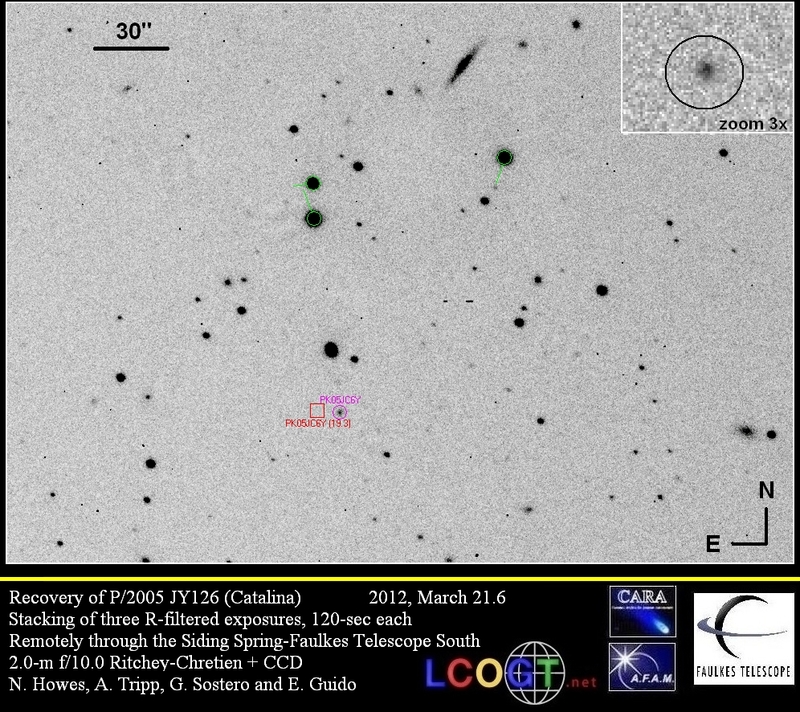 In the attempt to extende the observational arc of comet C/2013 A1, we perfomed some follow-up remotely from the Faulkes Telescope South (mpc code E10) on 2013, March 07.5 through a 2.0-m f/10.0 Ritchey-Chretien + CCD. Below you can see our image, stack of 11x80-seconds R-Filtered exposures. The galaxy just below the comet in the image is PGC177709. Click on it for a bigger version. Below you can see an animation (spanning 25 minutes and composed of 11 exposures, 80 seconds each) showing the movement of comet C/2013 A1. Click on the thumbnail below for a bigger version. Images of taken in collaboration with the Faulkes Project and Horbury Academy. Faulkes Telescope is operated by Las Cumbres Observatory Global Telescope Network. The MPC recently issued a new batch of comet astrometry (included our Faulkes South observations, see previous update) , and JPL/NASA has just updated their forecast of the upcoming close approach. Now the nominal closest approach is of ~0.0007357 A.U. which is around 110,060 km on 2014 Oct. 19 at approximately 18:50UT +/- 00:57. Probability of impact is now of 1 in 2300. After the latest observations, the probability of impact according to JPL is of 1 in 10000. 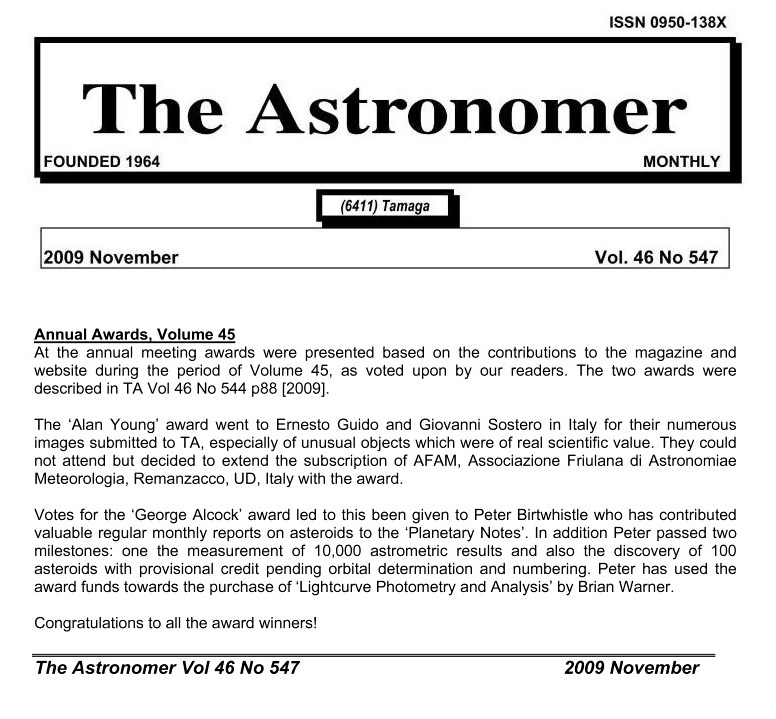 Aldo Vitagliano, author of the software Solex, created a video showing how the comet should miss Mars. In the video Mars is the red disk at the center of the video. The line-of-sight is in the plane of Mars' orbit, and the vertical axis of the plot is perpendicular to the Mars' orbital plane. The movie shows 2000 MonteCarlo clones of the comet, created assuming a standard error of 0.5 arcsecs for the observations. The (retrograd) cloud comes from below the orbital plane and crosses it before Mars arrives. See the video below. While assuming a standard error of 1 arcsecs for the observations, this results in a more "expanded" cloud of possible comets, and gives a small residual impact probability. See second video below. 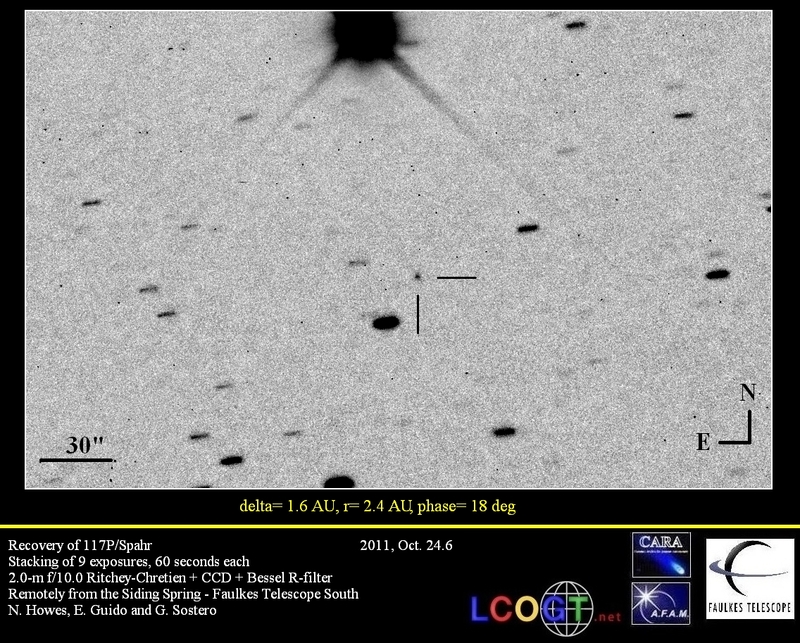 Please click here for a selection of some of the most significant results and images obtained from the observation of this flyby on 2014, October 19. M.P.E.C. 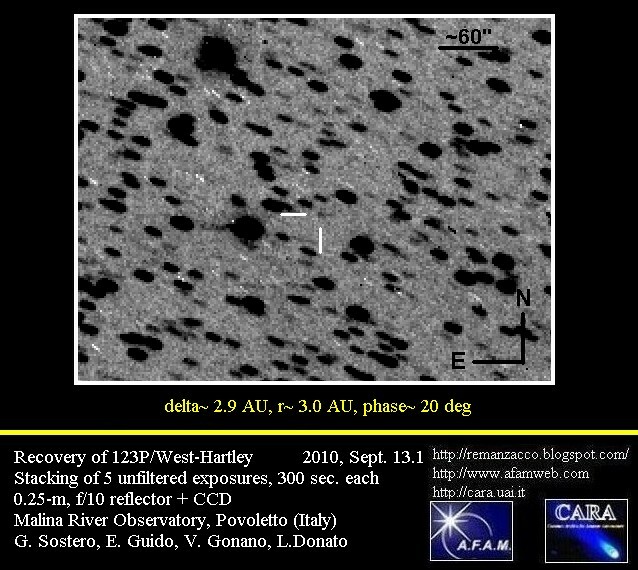 2013-E14, issued on 2013 March 04, reports the discovery of the asteroid 2013 ET (discovery magnitude 16.9) by Catalina Sky Survey (mpc code 703) on images taken on March 03.3 with a 0.68-m Schmidt + CCD. 2013 ET has an estimated size of 64 m - 140 m (based on the object's absolute magnitude H=23.1) and it will have a close approach with Earth at about 2.54 LD (Lunar Distances = ~384,000 kilometers) or 0.0065 AU (1 AU = ~150 million kilometers) at 1207 UT on March 09 2013. This asteroid will reach the peak magnitude ~15.0 on the first hours of March 09. 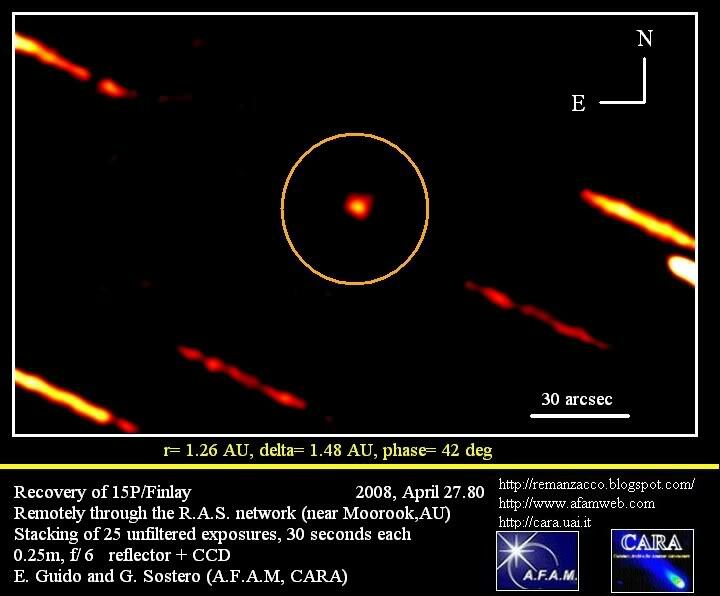 We performed some follow-up measurements of this object on 2013, March 04.4, while it was still on the neocp, remotely from the Haleakala-Faulkes Telescope North, through a 2.0-m f/10.0 Ritchey-Chretien + CCD (Faulkes Telescope is operated by Las Cumbres Observatory Global Telescope Network). Below you can see our image, stack of 5X10-second exposures, taken with the asteroid at magnitude ~16.9 and moving at ~6.15"/min. At the moment of the close approach 2013 ET will move at ~ 153"/min. Click on the image below to see a bigger version. North is up, East is to the left. Due to its close approach, 2013 ET was a strong radar target at Goldstone. On a message on mpml, JPL Radar Team confirmed they were able to detect radar echoes from 2013 ET at Goldstone on March 07. 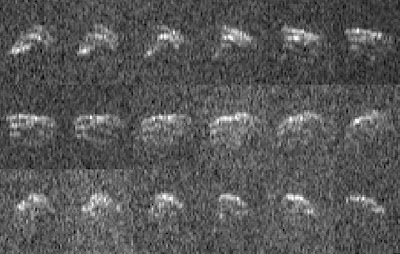 "The radar signal-to-noise ratios were stronger than expected and we obtained images with a range resolution as fine as 7.5 meters/pixel, but even so, the images barely resolve the object into a few range rows because 2013 ET is so small. 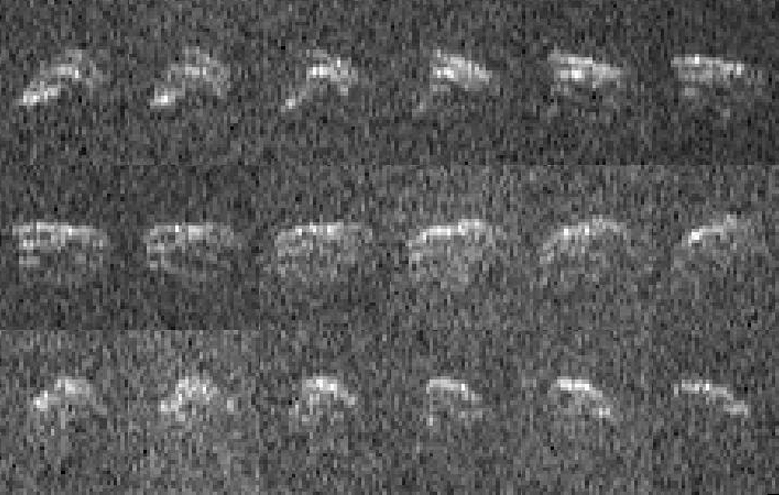 The Doppler broadening (aka the bandwidth) of the echoes varies as the asteroid spins, so clearly it's somewhat elongated, and there are hints of irregularity in the shape in the images. We're planning to release some images after the track on March 10 when we should see more detail if things go well." 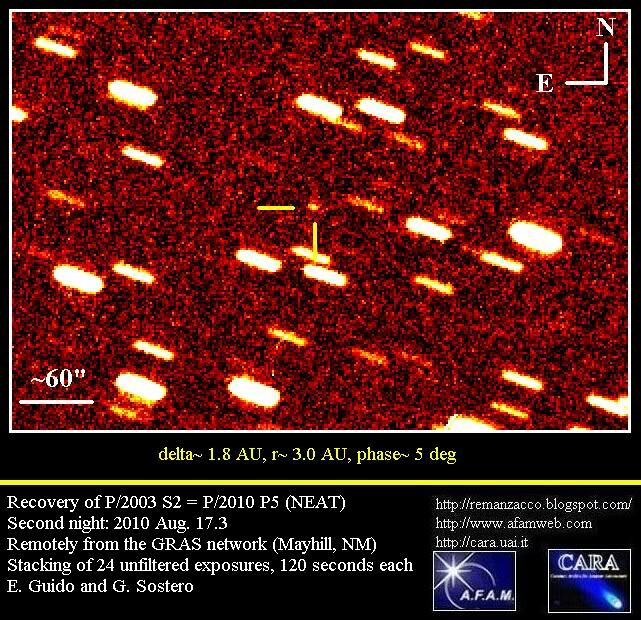 As announced on the previous update of this post, asteroid 2013 ET was successfully targeted by the 70-meter Deep Space Network antenna at Goldstone, Calif. A sequence of radar images was obtained on March 10, 2013 by NASA scientists when the asteroid was about 1.1 million kilometers from Earth, which is 2.9 lunar distances. "The radar imagery suggests the irregularly shaped object is at least 130 feet (40 meters) wide. The 18 radar images were taken over a span of 1.3 hours. During that interval, the asteroid completed only a fraction of one rotation, suggesting that it rotates once every few hours."